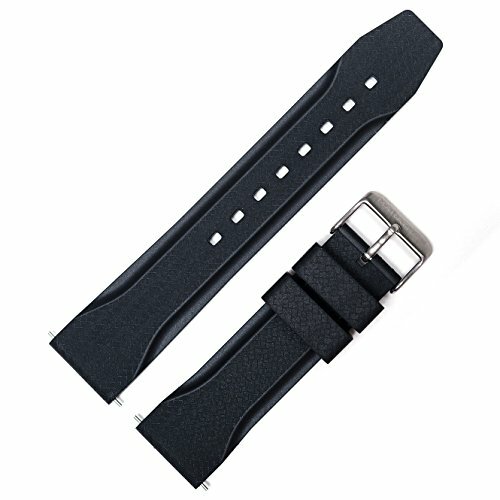 Marathon Divers Model Rubber Watch Band/Strap (22 mm, Black). Made in Italy. Marathon's vulcanized rubber strap is stylish, easy to install and very comfortable to wear. This high quality strap is totally waterproof with a carbon fiber texture that looks great both dressed up and casual. It features a 316L stainless steel signed buckle. Includes 22mm stainless steel shoulder-less spring bars installed. Made in Italy. VULCANIZED RUBBER: As supplied to U.S. Government. VANILLA SCENTED: Injected with refreshing vanilla smell. COMFORT: Comfortable to wear and flexible. Designed for diving and for search and rescue missions. Comes with 2 Swiss made stainless steel shoulder-less spring bars installed. Made in Italy. STAINLESS STEEL BUCKLE: Satin finish, non-magnetic 316L stainless steel signed buckle. COLOR: Black. Also available in Orange.